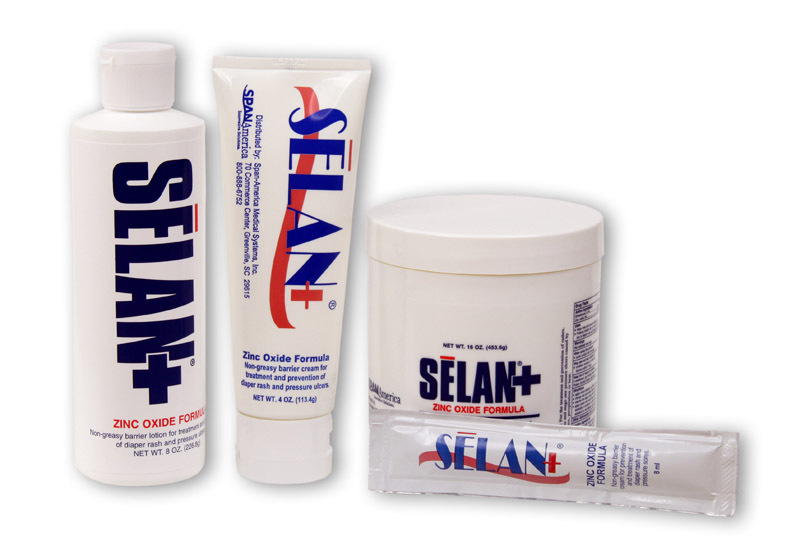 SELAN+ Zinc Oxide is a cost effective barrier cream that is creamy, absorbs quickly and leaves no greasy residue. Unlike petrolatum-based products which can clog the liners of disposable briefs, Selan+ Zinc Oxide is petrolatum-free and will not interfere with diaper absorption. The unique combination of ingredients including emollients, dimethicone, zinc oxide and humectants gives this product properties that make it an excellent moisturizer, protectant, and conditioner. Use for the treatment and prevention of diaper rash and other rashes due to moisture, stage one pressure ulcers, amputee tissue trauma, and the itch associated with end stage renal disease. Purified Water USP, Cetyl Alcohol, Sorbitol USP, Dimethicone, Glycerol Monostearate, Sodium Lauryl Sulfate, Lanolin USP, Methylparaben, Fragrance,Quaternium-15.